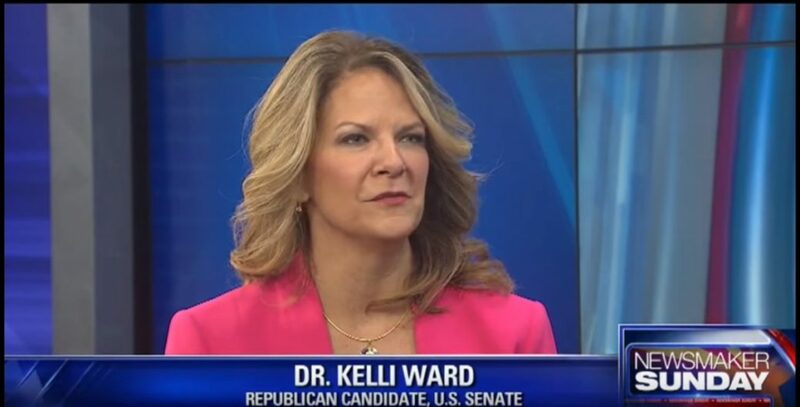 Can Kelli Ward Put Off This Nail-Biter Arizona Election? Hello, America. Lloyd Marcus, The Unhyphenated American, here, reporting in from the GOP U.S. Senate primary in Arizona. All month, the Conservative Campaign Committee, my wife Mary and I have been campaigning all over this beautiful state for great courageous conservative Dr. Kelli Ward. Dr. Ward launched a bus tour to counter the 5 million dollars spent lying about her and to get out the vote. https://kelliward.com/index Our Conservative Campaign Committee attended each rally on her tour. As an American who happens to be black, it was a pleasant surprise to see that the opening speaker at Dr. Ward’s rally in Lake Havasu was a young black man, former Tucson police officer, Brandon Tatum. https://bit.ly/2MAwd2b Brandon briefly explained that he was a former Democrat who voted for Obama. Eventually, Brandon realized the decline of our nation under Obama. Brandon supports Dr. Ward because she supports our police, president Trump, putting America first and Americans being united. Folks, I am extremely impressed with Dr. Ward. In her speeches, conservatism effortlessly flows from her. It’s in her heart. Obviously, Dr. Ward loves her country and is driven to help president Trump implement common sense solutions to problems. I have not heard any double-talk politician-speech coming from Dr. Ward. She says what she means and means what she says. Dr. Ward boldly proclaims her opposition to amnesty and desire to build the border wall. An Angel Family (family in which a member was killed by an illegal) attend the Tucson rally. In honor of the Angel Family, Dr. Ward asked a minister to end that rally in prayer. It was a remarkably moving moment. At one of the rallies, Dr. Ward expressed how hurtful and offensive it is that a McSally ad claims Dr. Ward does not support our military. Dr. Ward’s husband served in the Air Force for 33 years. Dr. Ward said military wives send their husbands off, not knowing whether or not they will return. Military wives want our military provided everything they need to win and return home safely. As a military wife and patriotic American, Dr. Ward strongly supports our military. As a physician, she knows how best to care for our veterans. Rep. Paul Gosar, a speaker at the rallies exposed Martha McSally, that she voted for amnesty 11 times. And yet, McSally is flooding the Arizona airwaves with lying ads about how she is the conservative candidate supportive of Trump’s agenda and Dr. Ward is a fake conservative. It was exciting to see so many young people at Dr. Ward’s rallies. Reps were in attendance from the young conservative group Turning Point USA https://www.tpusa.com/ and Latinos for Trump and Ward. Each Dr. Ward rally felt like a family gathering of Americans. Clearly, we were united in our confident belief that Dr. Ward will make a huge difference in Washington DC for Arizona and America. We long for racial unity and desire to see our homeland make great gain. Fake news media is feverishly promoting their narrative that more of Trump’s allies are turning against him and impeachment is right around the corner. While this gloom and doom is not true, it tells you what will happen if the GOP loses control of Congress. Trump needs strong brave conservatives in his corner, covering his back, more than ever. We have a golden opportunity to give our president and our country what they both desperately need, Dr. Kelli Ward.